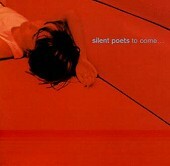 Spoken-word set to a jazzy, electronica (almost hip-hop at times) backbeat, Silent Poets' To Come... is anything but silent. It is perfect coffeehouse music. Playing over the P.A. at your favorite coffee house, while you sip on your hot mocha latte, Silent Poets are made for the pretentious coffee house crowd that loves to "think" and express their ideas, often forcing them on unsuspecting people who could care less. This album is all about pretension, though the hooks and poppy beats that come along are so tempting, you can't resist. I'll give it a C.